being little • bristol uk fashion & lifestyle blog. : actual pain//street casuals. WEARING: cardigan - charity shop ; tee - actual pain ; jeans - topshop ; socks - new look ; shoes - dr martens. I got home from Elliott's yesterday to find a few packages had arrived! One was a Christmas present for the boy himself, one is something I'll blog about at a later date, and last but not least was this awesome Actual Pain t-shirt from Street Casuals. I'd been eyeing up the dirty gothic Actual Pain designs for a while, and when I saw that my favourite tee was in the sale, I had to get it. I'm so pleased with it. It's really good quality, and the exact fit I was after. Don't start thinking that I'm anywhere near organised when I say I've bought a Christmas present for my boyfriend... because I'm definitely not. Buying presents for boys is stupidly difficult, but luckily, Street Casuals have come up with these little Christmas Gift Guides to help you along. Click here to see more ideas of what to get the men in your life! such a cute outfit, your cardigan is gorgeous! boy present buying is super hard. i just lost my job too so i've got no dolla!! I'm getting my boyfriend's presents through the post at the moment and it's exciting... although I just want to give them to him straightaway! I'm so bad at keeping secrets. love all the suggestions for what to buy guys, I've already been super organised and bought all my Christmas gifts this year! Love this outfit, t-shirt is great! LOVE that tshirt so much!! 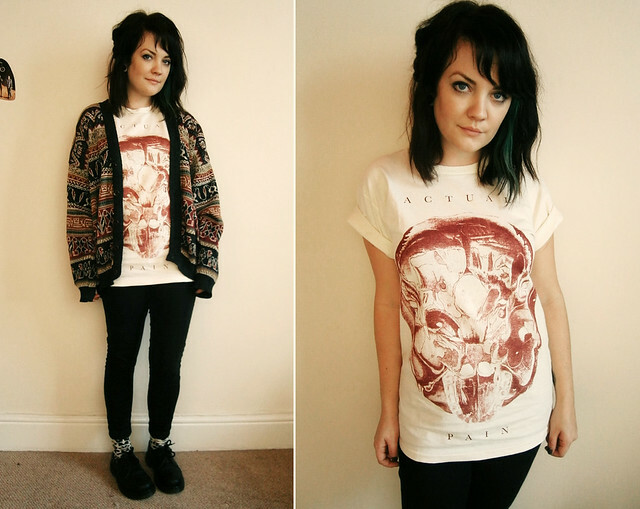 Love the grunge look :) The tee and cardi go very well together. Oh I agree- men are the hardest people to buy for! I love the print on your cardigan, such a cute design! just found your blog through a link on Sweet Monday's blog and i love it! You've got amazing style and I can't believe you made that cuddly toy cats.. skills! The tshirt looks gorgeous on you! <3 And I love the cardigan you paired it with! I absolutely loveee your cardigan! And your T-shirt and shoes! I think I might have to invest in a pair of Dr martens, they're wayy out of my budget but they do last forever. Buying for boys is so difficult- mine has gone from wanting a spa weekend (I was shocked), to an ipad (so 10 weeks of my whole income!) and now he wants a mini fridge (not too keen on that idea since I live with him and don't want a mini fridge my bed). Eurgh, men. I might buy him a pair of rubber gloves and tell him to get cleaning! I hate shopping for men... Blah.